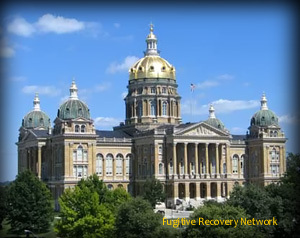 Below is basic information on bail bond laws for Iowa concerning Bail Enforcement, Bounty Hunters, Fugitive Apprehension and Bail Bondsman. This is not legal advice. Laws change frequently, please check the links provided for possible updates and current information. Iowa Code Annotated Title Iii. Public Services And Regulation Subtitle 1. Public Safety Chapter 80a. Private Investigative Agencies And Security Agents 80A.3. Requires a bail enforcement business to obtain the same license as that for a private detective. The license must be renewed every two years. 80A.5. Requires a licensee fee to be deposited with each application – to be applied if the application is granted and refunded if the application is denied. 80A.10A. Requires each potential licensee to submit proof of financial responsibility, notwithstanding the minimum bond amount that must be filed in accordance with section 80A.10. Iowa Code Annotated Title Xv. Judicial Branch And Judicial Procedures Subtitle 4.Probate—fiduciaries Chapter 636. Sureties–fiduciaries–trusts—investments Surety Companies 636.11. Iowa bail agent’s arrest authority. Iowa Code Annotated Title Xvi. Criminal Law And Proceduresubtitle 2. Criminal Procedure Chapter 811. Pretrial Release—bail 811.8.Establishes a bail agent’s arrest authority. Please check with the Iowa’s Department of Insurance, Licensing Board and/or Local Law Enforcement for the most recent updates. If you know of any updates to Iowa’s bail bond laws, please provide as much detail as possible and send to us using our contact form.